Last weekend, I kicked off fall by visiting 3 B’s Fine Furniture Consignment, a local business started by longtime friends Amy and Linda. 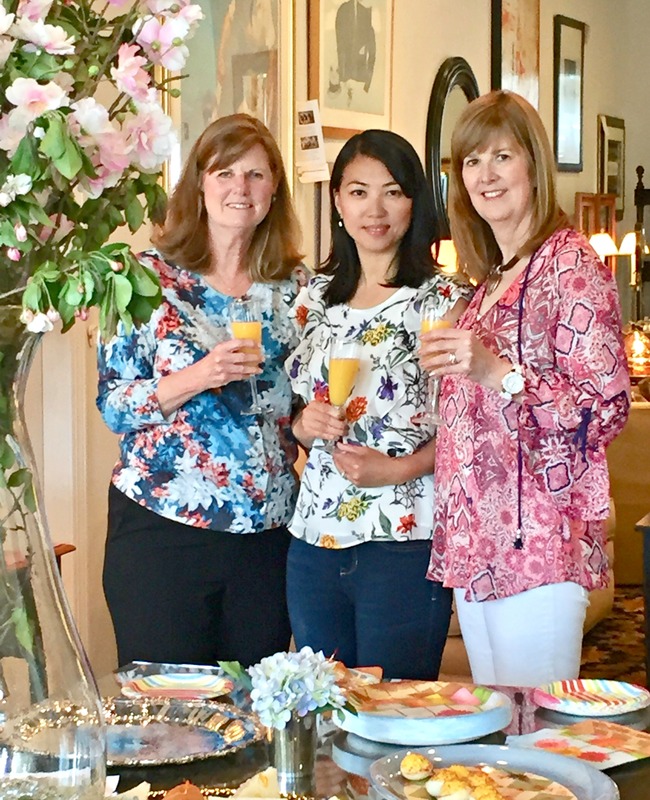 If you follow Beauteeful Living’s Facebook or Instagram accounts, you may recall my presentation at 3 B’s on the topic of “Refresh for Spring” last April. I was honored when the ladies invited me back to their store recently to celebrate their store’s 2 year anniversary! 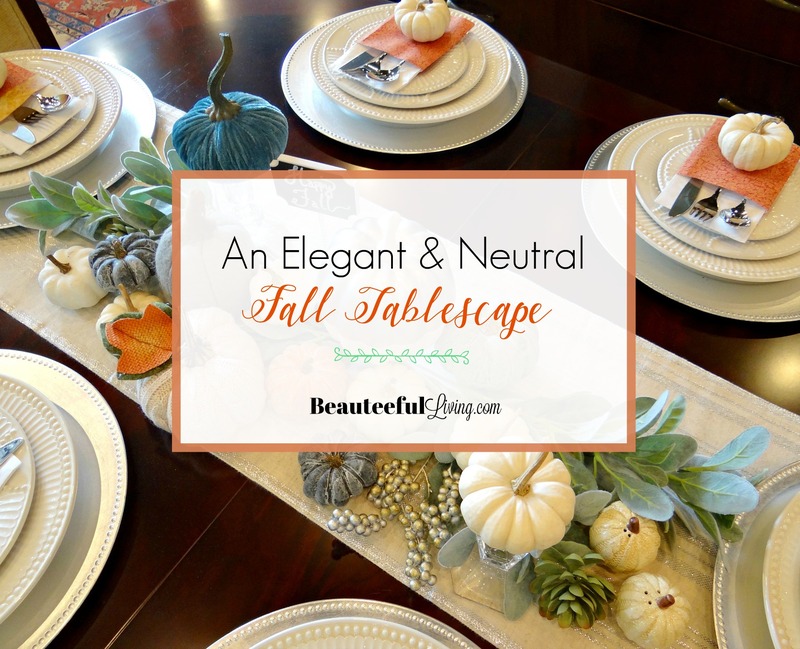 For their anniversary event last weekend, I created an “elegant and neutral” themed tablescape on location along with providing my “Fall Ideas & Inspiration” guide to 3 B’s customers. If you’re an e-mail subscriber of Beauteeful Living, be on a look out for this FREE guide very soon! Not a subscriber yet? Simply subscribe at the bottom of today’s post. 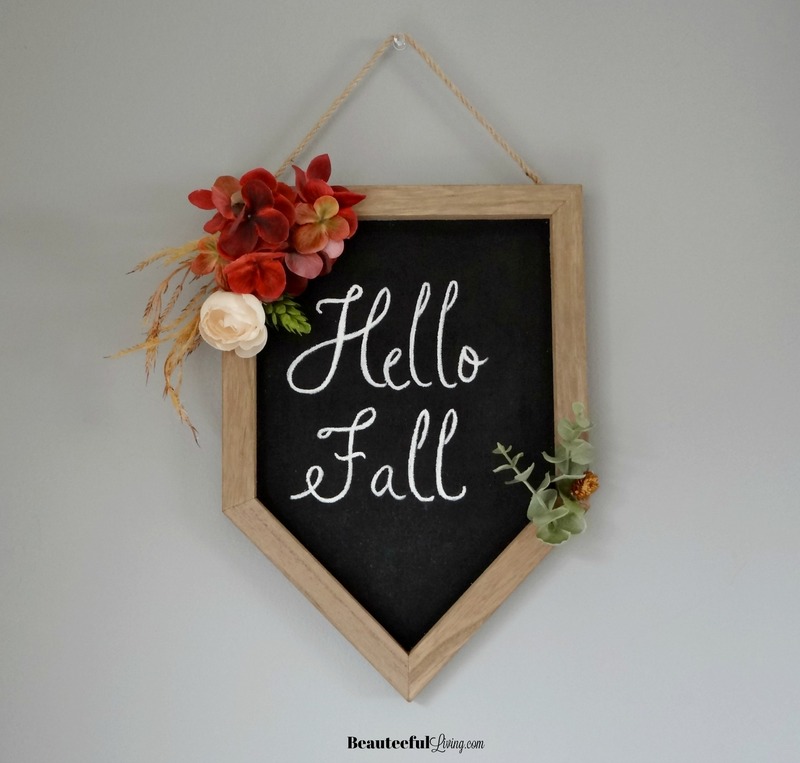 In celebration of fall, I created a limited edition of my “Hello Fall” wall sign. Right now, it’s only available for purchase at 3 B’s Furniture. 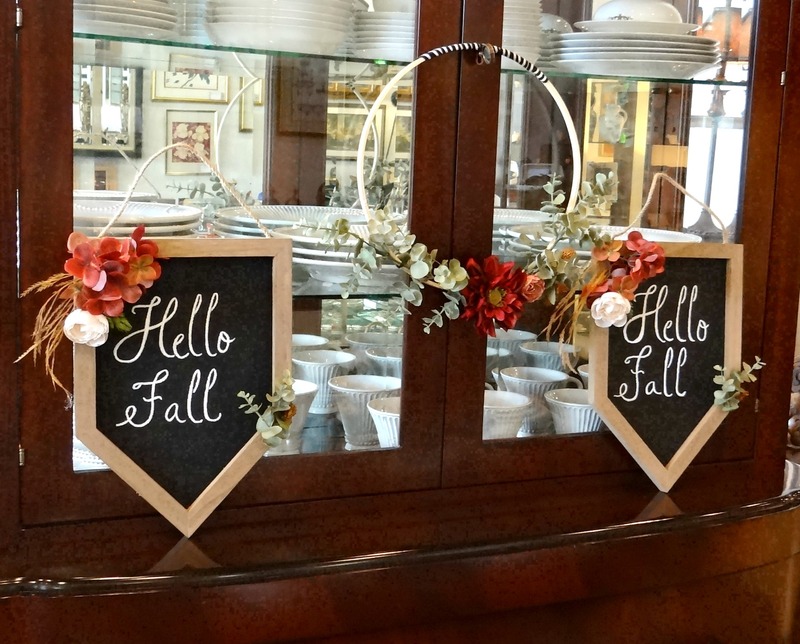 Against my dining room’s gray walls, this sign instantly warms up the space with the autumn-themed florals. They look quite festive perched against this dining hutch. 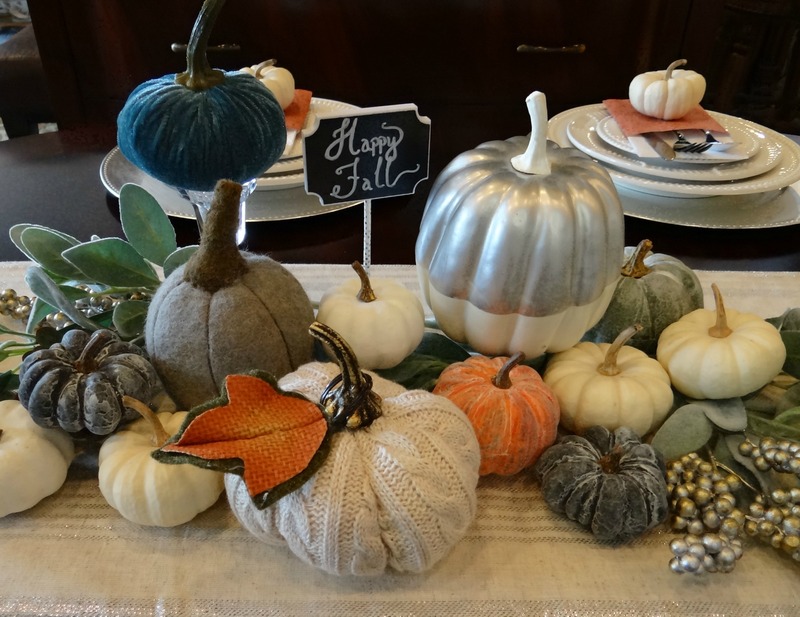 This neutral centerpiece is mainly comprised of mixing real with “faux fabulous” items. 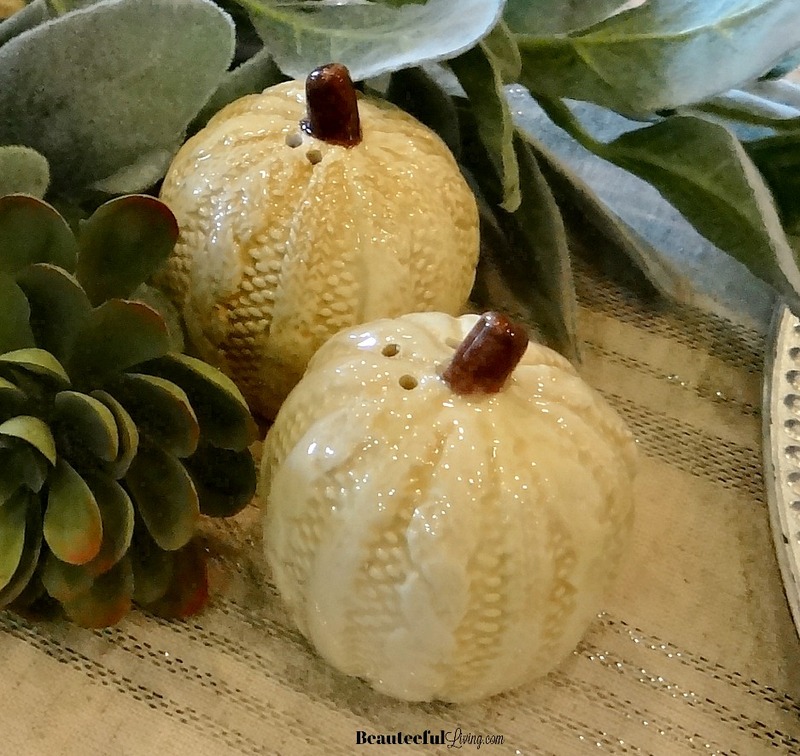 I paired white gourds that were real with a variety of faux gourds made of materials, ranging from felt to wool! Going with the “no fuss” motif, I decided against using candles and instead used my candlestick holders as pillars. 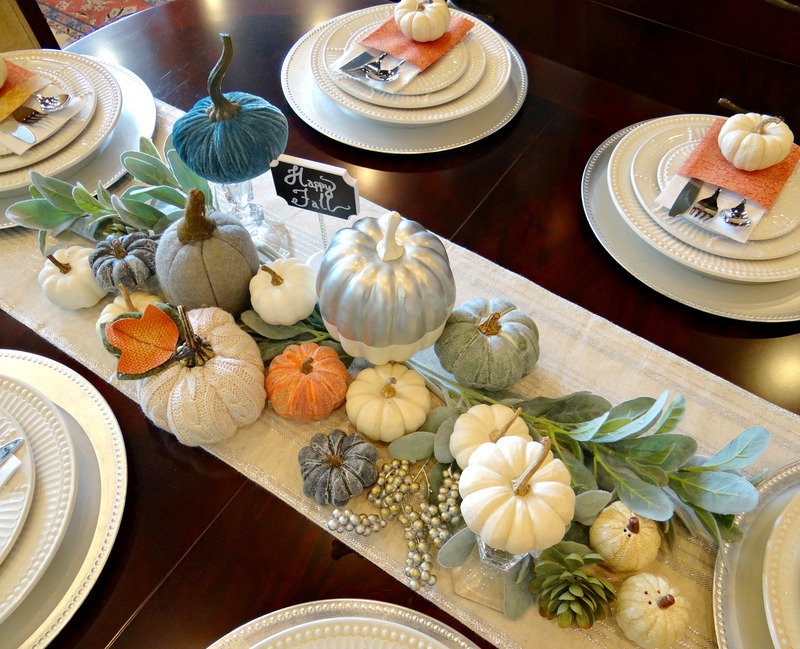 The candlesticks were the perfect items to elevate the gourds pictured below. 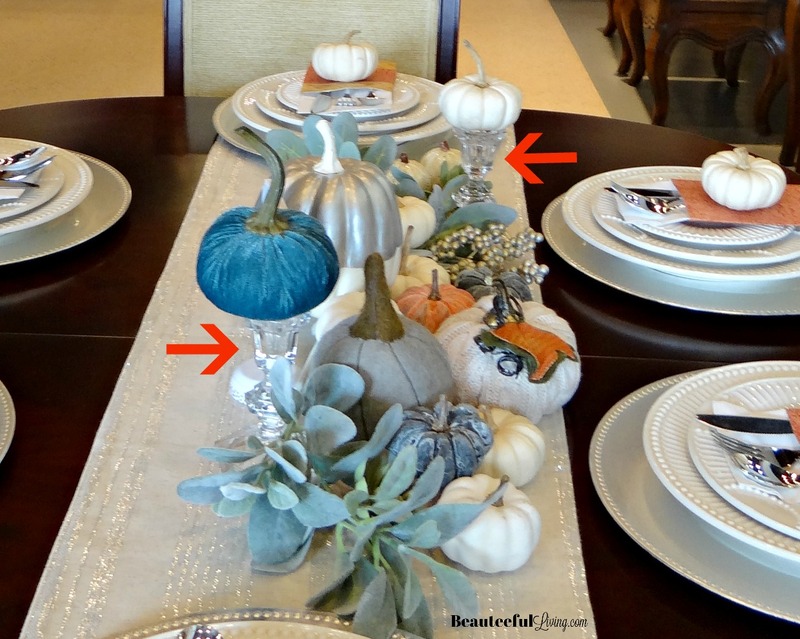 Don’t you just love that blue velvet faux gourd? 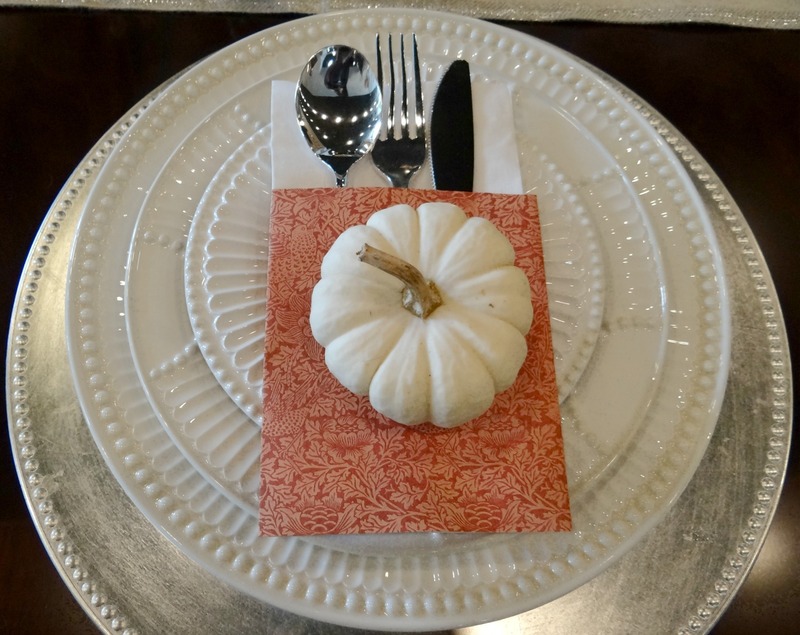 Two of my favorite elements from this elegant and neutral tablescape happen to be the white gourds and the craft paper used to decorate each place setting. 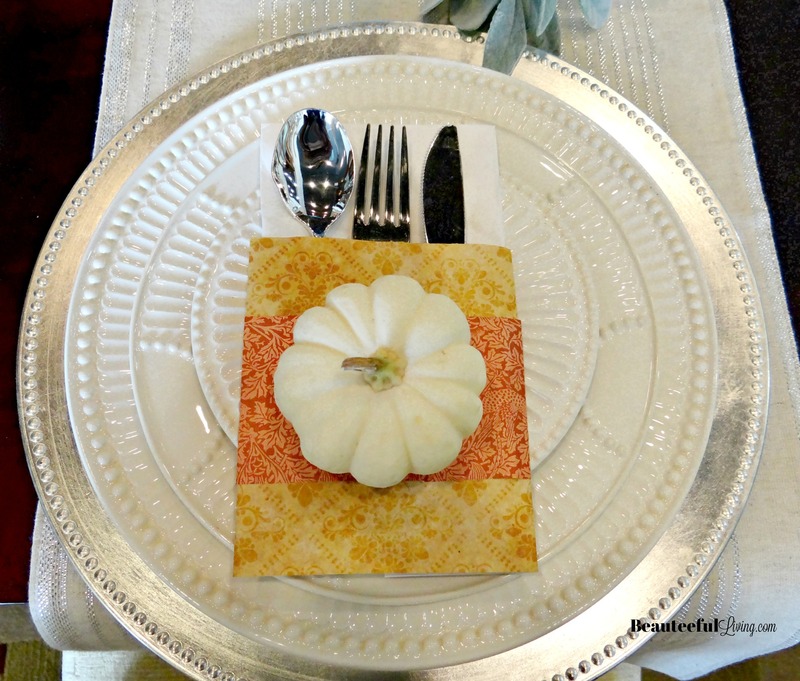 Using card stock to wrap napkins and cutlery is the perfect way to tie the whole elegant look together. 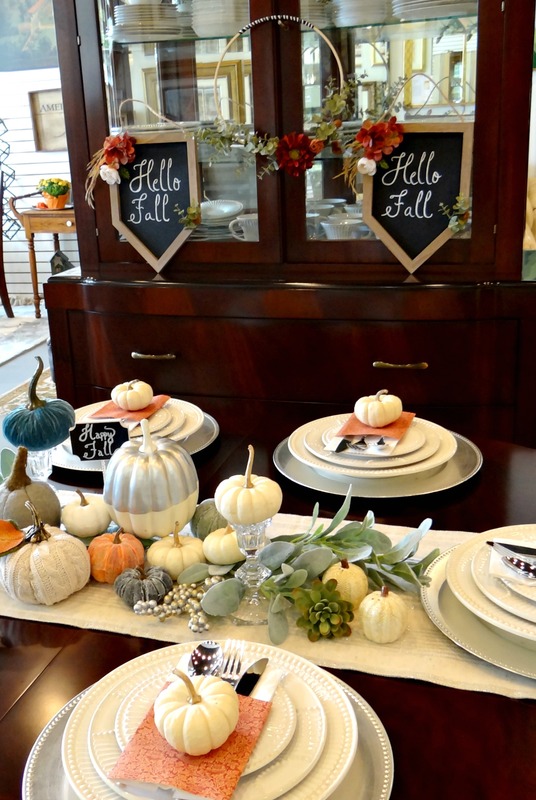 By the way, these Lenox dishes are available for purchase at 3 B’s Furniture! 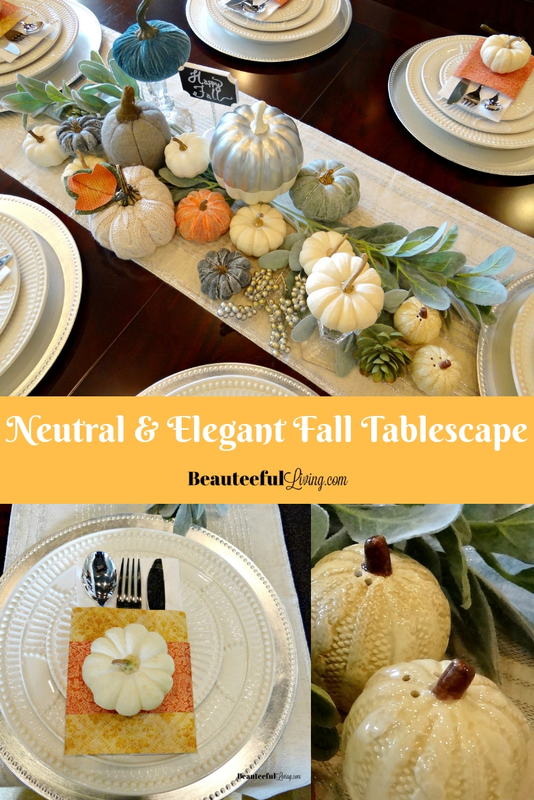 I’m really happy with the way this “elegant and neutral” themed tablescape came together. Before I go, here’s a photo of yours truly, taken last weekend! 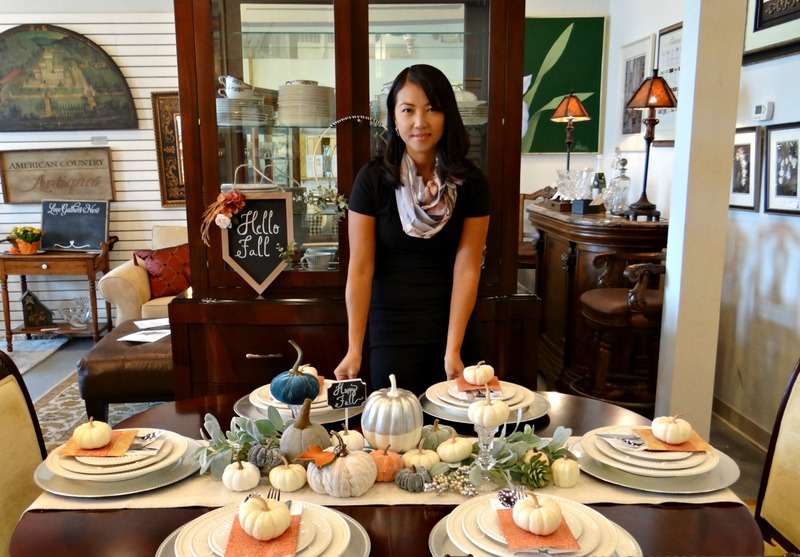 I had a great time setting up this tablescape on location and speaking with the lovely customers who stopped by that afternoon. 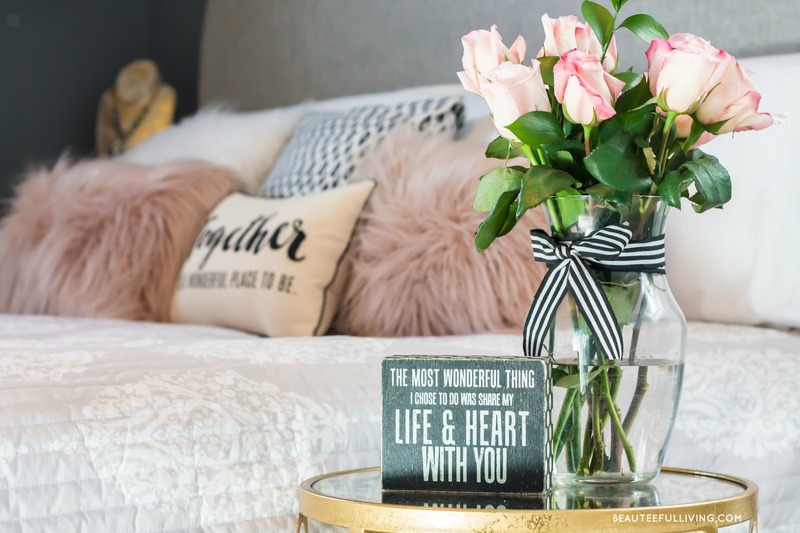 A very happy 2nd anniversary to 3 B’s furniture and a big welcome to Beauteeful Living‘s new subscribers from this event! Thanks for reading today’s post. Wishing you all a memorable and cozy fall ahead! 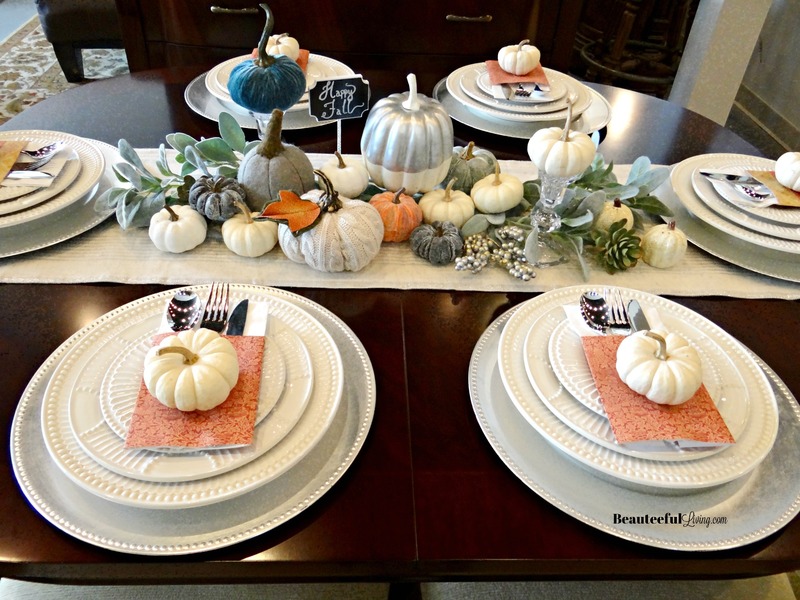 Your tablescape looks beautiful! I love the idea of using decorative craft paper. Your decorative signs are lovely! Thanks, Lauren! I love using craft paper for decor :). Hope you’re enjoy the first week of fall! Really loving all the neutral color schemes for fall. I’m totally stealing that idea of using scrap paper! I love those mini white gourds! I’m going to see if my local nursery has them. I usually see the orange ones but I really love how the white gourds look on the table. Thanks for sharing! Thanks, Evelyn! Hope your nursery has those white gourds. I also saw them at Trader Joe’s recently too.